We all had a fabulous time. They boys loved being able to run and be free and we loved being able to relax and know they were safe and having fun without having to be constantly supervised. Please DON’T USE GPS TO LOCATE US it will throw you into the Forest! Turn directly off the Pacific Highway into Waterfall Way turnoff into Bellingen, about 20 minutes into town. Top up on any groceries you may need in town. Turn into Church Street towards the Hospital. At the top of the hill turn left at the Roundabout. You are driving towards Brierfield and this is Bowraville Road. Stay on Bowraville Road all the way until you come to a fork in the road (about 15kms). 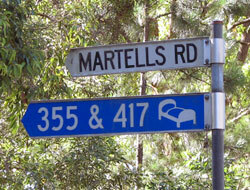 There is only one fork, take the left fork, Martells Road and we are precisely 4.17kms on your left. No. 417 look for the Yellow Rooster sign on the gate. Take the Ballards Road turnoff towards Urunga from the new Pacific Highway. You will be on the old highway, turn towards Urunga. 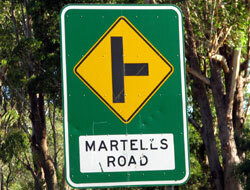 Just South of the town, turn LEFT into Martells Road directly off the Old Pacific Highway, it is signposted . It is 9kms of dirt however, graded regularly – you do not require a 4WD. You will drive over a new bridge that goes over the new Highway, keep driving on the dirt until you come to sealed road. You will begin to see farms and homes, keep driving and we are on your right, No. 417 – Look for the Yellow Rooster sign on the gate. If coming from the South and you don’t wish to drive down the dirt road, keep driving North on the Pacific Highway until you come to the Bellingen turnoff, Waterfall Way. Then follow the directions above from Bellingen town to us.